Antipope Felix V, the last historically significant Antipope. An antipope (from Latin: meaning "rival-pope" or "counter-pope") is a person who makes a controversial, yet substantially accepted, claim to be the lawful Pope, and is elected in opposition to the Pope that is recognized by the Roman Catholic Church. Antipopes are typically those supported by a fairly significant faction of cardinals, and in several cases it was hard to tell who was, in fact, the lawful Pope, since the claim of each was widely accepted. There have been several antipopes throughout the history of the Roman Catholic Church. The period when antipopes were most numerous was during the struggles between the Popes and the Holy Roman Emperors of the eleventh and twelfth centuries. The emperors frequently imposed their own nominees, in order to further their cause. (The popes, likewise, sometimes sponsored rival imperial claimants in Germany in order to overcome a particular emperor.) Rival claimants to the papacy were also common during the Western Schism and the Avignon Papacy. In modern times, claimants to the Papacy who have few followers, such as the Sedevacantist antipopes, are not generally counted as antipopes, and therefore are ignored for regnal numbering. The earliest antipope is debated. According to the Catholic Encyclopedia, Natalius was the first antipope but he allegedly recanted and came back to the fold. However, the most widely recognized earliest antipope was Hippolytus of Rome (d. 235) who protested against Pope Callixtus I and headed a separate group within the Roman Catholic Church. Hippolytus was later reconciled to Callixtus's second successor Pope Pontian, when both were condemned to the mines on the island of Sardinia. He has been canonized by the Roman Catholic Church. Whether two or more persons have been confused in this account of Hippolytus, and whether Hippolytus actually declared himself to be the Bishop of Rome, remains unclear, especially since no such claim is found in the writings attributed to him. Novatian (d. 258), another third-century figure, certainly claimed the See of Rome in opposition to Pope Cornelius, and is thus reckoned as another early antipope. Additionally, the Catholic Church endured a prolonged period of crisis that lasted from 1305 until 1416. During these years, the Church found its authority undermined, openly challenged, and divided among rivals. Although it emerged at the end of the period with its authority seemingly intact, the struggle brought significant changes to the structure of the Church and sowed seeds that would later sprout in the Protestant Reformation. This century of crisis can be divided into two periods of unequal length: the Avignon Papacy and the Western Schism. In 1378, Gregory XI moved the papal residence back to Rome and died there. After 70 years in France the papal curia was naturally French in its ways and, to a large extent, in its staff. Back in Rome some degree of tension between French and Italian factions was inevitable. This tension was brought to a head by the death of the French pope Gregory XI within a year of his return to Rome. The Roman crowd, said to be in threatening mood, demanded a Roman pope or at least an Italian one. In 1378 the conclave elected an Italian from Naples, Pope Urban VI. His intransigence in office soon alienated the French cardinals. And the behavior of the Roman crowd enabled them to declare, in retrospect, that his election was invalid, voted under duress. The French cardinals withdrew to a conclave of their own, where they elected one of their number, Robert of Geneva. He took the name Pope Clement VII. By 1379 he was back in the palace of popes in Avignon, while Urban VI remained in Rome. This was the beginning of the period of difficulty from 1378 to 1417 which Catholic scholars refer to as the "Western schism" or, "the great controversy of the antipopes" (also called "the second great schism" by some secular and Protestant historians), when parties within the Catholic church were divided in their allegiances among the various claimants to the office of pope. The Council of Constance in 1417 finally resolved the controversy. For nearly 40 years the Church had two papal curias and two sets of cardinals, each electing a new pope for Rome or Avignon when death created a vacancy. Each pope lobbied for support among kings and princes who played them off against each other, changing allegiance when according to political advantage. In 1409 a council was convened at Pisa to resolve the issue. The council declared both existing popes to be schismatic (Gregory XII from Rome, Benedict XIII from Avignon) and appointed a new one, Alexander V. But neither of the existing popes had been persuaded to resign, so the church had three popes. Another council was convened in 1414 at Constance. In March 1415 the Pisan pope, John XXIII, fled from Constance in disguise; he was brought back a prisoner and deposed in May. The Roman pope, Gregory XII, resigned voluntarily in July. Political theorists in the mid-fourteenth century began to express the view that the papacy was not even the supreme power source in the church, but that a duly-convened council of the higher clergy could override popes in circumstances that warranted intervention. The Schism was the supreme example of such circumstances, and the actions of the Council of Constance, which deposed three rival popes and elected a single pope to take up residence in Rome, represented the high point of conciliarist influence. Soon after, however, Pope Martin V, the very pope whom the council had put in place began the work at setting aside conciliarist attempts to make regular meetings of councils a permanent feature of church governance. Thus, the Great Western Schism, which, on the grounds of the allegedly invalid election of Pope Urban VI, began in 1378 with the election of Clement VII, who took up residence in Avignon, France, led to two, and eventually three, rival lines of claimants to papacy: the Roman line, the Avignon line, and the Pisan line. The last-mentioned line was named after the town of Pisa, Italy, where the council that elected Alexander V as a third claimant was held. To end the schism, the Council of Constance deposed, in May 1415, John XXIII of the Pisan line, whose claim to legitimacy was based on a council's choice. 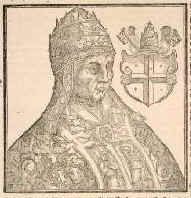 Pope Gregory XII of the Roman line resigned in July 1415. The Council formally deposed Benedict XIII of the Avignon line, who refused to resign, in July 1417. Afterwards, Pope Martin V was elected and was accepted everywhere, except in the small and rapidly diminishing area that remained faithful to Benedict XIII. The scandal of the Great Schism created anti-papal sentiment and fed into the Protestant Reformation at the turn of the sixteenth century. "At this point, as again in the mid-eleventh century, we come across elections in which problems of harmonizing historical criteria and those of theology and canon law make it impossible to decide clearly which side possessed the legitimacy whose factual existence guarantees the unbroken lawful succession of the Successors of Saint Peter. The uncertainty that in some cases results has made it advisable to abandon the assignation of successive numbers in the list of the Popes." As for Sylvester III, sometimes listed as an Antipope, the Holy See's Annuario Pontificio classifies him as a Pope, not an Antipope. In line with its above-quoted remark on the obscurities about the canon law of the time and the historical facts, especially in the mid-eleventh century, it makes no judgement on the legitimacy of his takeover of the position of Pope in 1045. The Catholic Encyclopedia places him in its List of Popes  though with the annotation: "Considered by some to be an antipope." Whilst all modern claimants to the Papacy are technically antipopes, none of them have received wide enough recognition, as defined earlier in this article, to be considered as true antipopes. Modern antipopes are religious leaders of breakaway Roman Catholic sects who reject the commonly recognized Popes and instead claim the papacy for their own leaders. The Roman Catholic Church regards these as excommunicated schismatics as having incorrect views. Most (but not all) of these groups derive from sedevacantism and thus are often called Sedevacantist antipopes or, more correctly, as Conclavist antipopes. Both Sedevacantists and Conclavists believe that the Popes of recent decades were heretics and not legitimate popes. While sedevacantists, as their name indicates, actually believe that the see of Rome is vacant and recognize nobody as Pope, Conclavists believe that by electing someone else as Pope, they have ended such vacancy. Those individuals who have been chosen or have set themselves up as replacement popes are sometimes called antipopes. In contrast to historical antipopes, the number of their followers is minuscule and therefore they are mostly not recognized as serious claimants to the papacy. Some modern anti-popes have developed their own religious infrastructure, thus being popes of their particular sect. A significant number of them have taken the name "Peter II," due to its special significance. In 1950, Frenchman Jean Colin claimed to receive revelations from God and to have been made Pope (even while Pope Pius XII was alive) as "Pope Clement XV." Pope Pius XII publicly declared him by name a "vitandus" excommunicate (one who should be avoided). In 1963, Jean Colin founded the ultra-liberal, ultra-modernist "The Renewed Church of Christ" or "Church of the Magnificat," based first in Lyons, then at Saint Jovite, Quebec, Canada. The Colinites have since disintegrated into several factions, with one successor "Pope" in France. Another, larger, faction is led by Jean-Gaston Tremblay, one of Colin's disciples, who declared himself constituted "Pope" by apparition even before Colin had died and who calls himself "Pope John-Gregory XVII." He is now based in Saint Jovite, as head of the "Order of the Magnificat" and "The Apostles of the Latter Days." Another group known as the Palmarian Catholic Church accepts the Roman Catholic Popes until 1978, including Pope Paul VI, who is revered by them as a "martyr pope." However, they reject all subsequent Roman Catholic popes since 1978, and in their place, they elevated Clemente Domínguez y Gómez as Pope Gregory XVII. Gómez claimed to have Marian apparitions that informed him that the Vatican had become corrupt. He had a vision that the Holy See should be transferred to Palmar de Troya in Spain, and the Roman Pope excommunicated. In 2005, Clemente Domínguez y Gómez was succeeded by Manuel Alonso Corral (as Peter II, the Pope of the Palmarian Catholic Church). ↑ Oxford English Dictionary: Antipope Retrieved December 17, 2007. ↑ Bruce M. Metzger, The Canon of the New Testament: Its Origin, Development, and Significance. (Oxford University Press, 1997), 149. ↑ The catacombs the destination of the great jubilee - Retrieved September 23, 2007. ↑ Pope Martin V Retrieved December 17, 2007. ↑ List of Popes, Retrieved December 17, 2007. This page was last modified on 6 April 2016, at 19:36.